The year 2017 is significant for several reasons. This year, the children of the Church prayerfully commemorate the restoration of canonical communion between the Russian Orthodox Church Outside of Russia and the Moscow Patriarchate (May 17, 2007), the 35th anniversary of the appearance of the myrrh-streaming Montreal-Iveron Icon of the Mother of God (November 24, 1982), and 20th anniversary of the martyr death of her guardian, Jose Muñoz-Cortes (October 31, 1997), and the 10th anniversary of the appearance of the myrrh-streaming Hawaiian-Iveron Icon of the Mother of God (October 6, 2007). Preparations for the 19th annual pilgrimage to Holy Trinity Monastery in Jordanville, which pilgrimage Washington’s St. John the Baptist Cathedral organizes yearly, began long before the trip itself. Registration began immediately after the patronal feast day of the Beheading of St. John the Baptist, and within a matter of days all of the spots on two tourist buses were filled. Groceries had to be bought and meals prepared for our stay at the "Diasporan Lavra," both for the multitude of pilgrims and for the brethren of Holy Trinity Monastery. This practice was introduced at the very start of our pilgrimages, and aims to avoid distracting the monastery brethren from their prayerful work. At the time, this was a request of the ever-memorable abbot of the monastery and First Hierarch of ROCOR – Metropolitan Laurus. One week before the pilgrimage, Archpriest Victor Potapov (rector of St. John the Baptist Cathedral) joined by his Matushka Maria, head sister of the cathedral’s Holy Virgin Protection Sisterhood Marina I. Zacharin, and parishioner Natalia V. Shevchenko, departed for the monastery, in order to prepare for display an exhibit of holy items and various personal effects of Brother Jose, which are safekept at Fr. Victor’s home. The organizers rushed to set up the exhibit, in order that it might be ready for the beginning of the autumnal Pastoral Conference for clergy of the Eastern American Diocese, which was held October 23-26. Among the principle display items was an "Optina" copy of the Montreal-Iveron Icon of the Mother of God. More on this icon below. On the eve of the annual pilgrimage to Holy Trinity Monastery, on Friday, October 27, pilgrims who live far away from Washington arrived in the American capital in order to spend the night in the parish house, go to Confession, and assist with the preparations. Joining our local pilgrimage group were Orthodox Christians from the West Coast, other U.S. states, and even France and Canada. The following day, Saturday, October 28, 100 people gathered at the church at 6 o’clock in the morning. A huge quantity of supplies, along with personal items, was loaded onto the buses, which soon departed. The parish caravan followed after them, along with several private cars filled with pilgrims. The journey from the capital to Jordanville is a long one (seven hours), but thanks to prayers, brotherly interaction, and spiritual talks dedicated to the history of the monastery and martyric struggle of Brother Jose, the time flew by unnoticed. "This icon, which abundantly streamed miracle-working myrrh for 15 years, consoled our Russian Church Abroad, a visible and tangible symbol of the mercy of the intercession of the Mother of God for us sinners… Did we act in a worthy manner during the presence in our Church of this Icon, which clearly performed miracles? Did we put to good use this visitation of the Mother of Our Lord for our souls, and is it not our collective sin of having grown cold towards this holy Icon and in our prayers, cold to the works of charity and witness to the Orthodox faith, that was the reason for its disappearance, through God’s will? "With tremulous gratitude we prayerfully recall the arrival of this wondrous myrrh-streaming Icon in our Church, and with repentance we pray to the Most Holy Mother of God for the forgiveness of our transgressions, for peace to reign in our Orthodox Church…"
Fr. 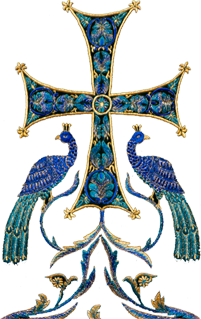 Victor further shared his conviction that the penitent epistle of the ROCOR hierarchs is just as relevant in our time, and opened the door to further development and finally completing the process of restoring canonical communion between the MP and ROCOR. Fr. Victor went on to thank those gathered for their zeal in supporting the veneration of Brother Jose, and for not forgetting his marvelous service to Christ’s Church. It was also noted that the appearance of the myrrh-streaming Hawaiian Icon is a direct continuation of the miracle of the Montreal-Iveron Icon. After the panihida, during the singing and reading of the akathist to the Montreal Icon at Brother Jose’s graveside, all those present were anointed with holy myrrh from the Hawaiian-Iveron Icon of the Queen of Heaven, and all who desired received a small bottle with oil from the lamp on Brother Jose’s grave, dirt from his gravesite, a small photograph of the chosen one of the Mother of God, and a booklet with a canon and akathist to the Montreal Icon. The pilgrims likewise all ate the kutia blessed on his grave. After the Saturday panihida, the Hawaiian Icon was taken to the monastery cathedral. After the evening meal, pilgrimage participants gathered in the monastery cathedral for a triumphal, three-hour monastery Vigil. Throughout the evening service, Fr. Victor and Washington cathedral cleric Priest Alexander Resnikoff heard confessions in the lower church of Venerable Job of Pochaev from those pilgrims who expressed their desire to commune of Christ’s Holy Mysteries the following day. On Sunday, October 29, His Eminence, Metropolitan Hilarion, celebrated Divine Liturgy, co-served by twelve priest and a number of deacons. Worshippers were deeply impressed by the well-structured and touching singing of the seminary choir. After the Prayer Behind the Ambo, Archpriest Serge Lukianov (Eastern American Diocesan secretary) delivered a heartfelt sermon dedicated to the 35th anniversary of the appearance of the Montreal Icon, the 20th anniversary of the murder of Brother Jose, and the 10th anniversary of the Hawaiian Icon. After lunch, the pilgrims remained in the large seminary graduation hall in order to listen to eyewitness accounts of various miracles that had occurred in connection with the Montreal & Hawaiian Icons. Fr. Victor opened the gathering with a story about the above-mentioned "Optina" Icon. In early March 2002, a small group of ROCOR clergy visited Optina, where a now famous meeting took place with the then-head of St. John the Baptist Skete, Hieromonk Tikhon, and his assistant, Hieromonk Michael. Fr. Michael had at one time received several icon boards that had belonged to the murdered Brother Jose Muñoz-Cortes and had been kept at Fr. Victor’s home following Brother Jose’s martyric death. The boards were given over to Optina, owing to the fact that the monks of the Hermitage honor the memory of Jose and consider him their brother in Christ (Jose’s Heavenly patron in his secret monastic tonsure was Venerable Ambrose of Optina). Fr. Michael ordered an exact copy of the Montreal-Iveron Icon of the Mother of God, to be painted on one of these boards. Fr. Michael related to the visitors from America that this icon had, by that point, been streaming myrrh for three months. The priests were convinced when Fr. Michael brought the icon out of his cell to the church and they beheld it with their own eyes. Having prayed before the icon, the priests bade Fr. Michael farewell and continued their visit around the skete. Having visited the small skete house of the Venerable Elder Ambrose, the priests made to depart the skete and return to the monastery, but were delayed at the skete’s "beautiful gate." Suddenly, someone ran out to Fr. Victor and asked him and matushka to return to the skete. Fr. Michael came out to meet them and handed over the Iveron Icon of the Mother of God to Fr. Victor, telling him that the icon must return with him to Washington. Fr. Victor took the icon, and Fr. Michael turned and silently walked away. From that time, the "Optina" Icon occupies an honored spot on the wall of the left kliros in St. John the Baptist Cathedral in Washington. "’Blessed is our God, always, now and ever, and unto the ages of ages.’ And suddenly – rain: stubborn and enough to soak through one’s clothes The people stood under umbrellas, but the candles on Brother Jose’s grave were not extinguished until the end of the panihida. "And at 5 o’clock in the evening, when Abbess Elisabeth and I came once more to the grave, the candles were still burning. "We decided to return once more at 6 o’clock, almost certain that the candles would be extinguished under the strengthening rain. With us was a pilgrim from Boston. "It grows dark early now, and here in the total darkness of the cemetery we saw it – the victorious Paschal flames at the grave of the martyr, whose entire life had become a witness to fidelity, love, and the strength of the Spirit. In the dark, it was difficult to determine what precisely was burning. It seems at first as though the wet ground itself was aflame, or else that the fire was emanating from the melted wax now mixed in with it. Soft blue tongues of flame flickered above the ground. "Mother Elisabeth and our companion filmed this sight. "We stood for a long time before the grave. The tall candles had long since gone out, but in places there were pockets in the ground, which had not preserved even a trace of the candle, but which were encircled with flat waxen crowns. Our companion added his commentary to the film: ‘It has been raining all day, and despite this, the ground is still aflame. It seems as though the fire is rising directly out of the ground…’ And he went silent, not daring to speak aloud the idea that the flames were alight in our hearts, and were they no metaphor. "Love emanated from Brother Jose’s grave; all around is darkness and cold rain, even our souls would not find warmth and here – Paschal fire emanating from the grave, calling us to spiritual awakening and love. The above-mentioned film of the candles burning in the rain was then shown, in confirmation of Mother Theodora’s story. 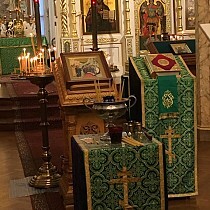 Alexander Korolev, a pilgrim from Canada, concluded the gathering with an attempt to give meaning to Mother Theodora’s narrative of the sign of the candles. A film of all three presentations will be put on the website of St. John the Baptist Cathedral in the near future. Spiritually enriched by their visit to Holy Trinity Monastery and the warm brotherly interaction, the pilgrims did not even notice how quickly the seven-hour ride home flew by. Got grant that, with time, an ever greater number of people will visit and support the holy habitation named for the Most-Holy Trinity and the burial site of the chosen one of the Mother of God, and may the Lord grant that the blessed day will arrive when Brother Jose, the last Orthodox martyr of the 20th century, will be glorified among the assembly of the holy martyrs.